Finely crafted with selected materials, this Songmics Jewelry Box offers an elegant solution to store your jewelry while adding décor to your home. With multifunctional design, this classic jewelry box helps to keep all your jewelry safe and well-organized. 6 drawers offer large space and protect your precious items from dust and scratches. Hooks and pockets add more room for necklaces. 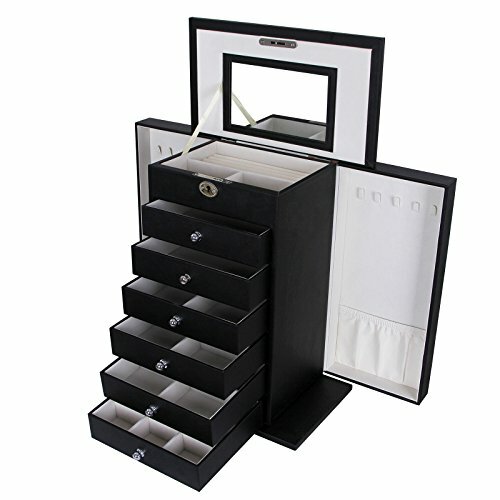 All in all, this large jewelry box is large enough to hold your necklaces, bracelets, rings, earrings, cuff-links, brooches, chains, and other jewelry. – Dimensions: 10 7/8″ L x 6 1/4″ W x 14 1/8″ H?27.5 x 16 x 36 cm?